I felt silent, the moment he saw a frown on my face he said, ‘Alright alright, forget what you’ll are doing and not doing, I will have to tell you what’s happening in the park. Not only chowki’s they have constructed five star toilets, new roads, anicuts, talai’s (artificial water bodies). Do you think Rajbag is an important area? I replied, yes it is beautiful with lots of water and ample prey base for the tiger.’ Jogi said, ‘Dear, tiger can find water and prey in many places of the park but it also needs a solitary secluded place for delivering cubs and most importantly for raising them in isolation for first 2- 3 months.’ Now the FD has spoiled such areas. I said chowki’s are going to be constructed....after all they are required to stop unwanted human intrusion. Jogi asked, ‘What kind of human intrusion?’ i said, ‘cattle grazers and poachers’. 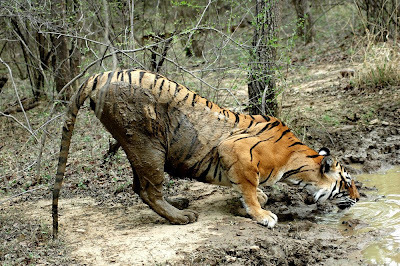 Devi Singh admitted that he had shot tiger right below the Kachida Chowki near water hole. This vehicle is donated by Mark Hillery of Tudor Corporation; you can clearly see children and women sitting in it. VIP tourism in patrolling vehicle is a regular feature of RNP! 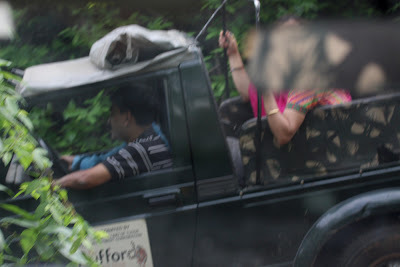 This is a gypsy donated by Rufford Foundation, women sitting behind for park ride. VIP tourists in red light, red strip vehicles and the subsequent pressure on the park! 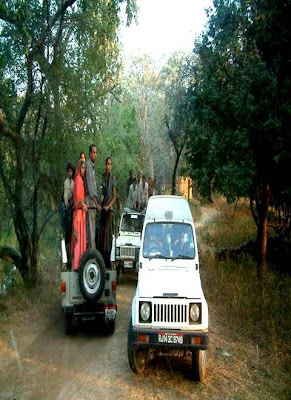 In a disheartened tone jogi continued, ‘Dear all the forest department patrolling vehicles are engaged in touring VIP’s all day and the officers are stationed for cutting park entry tickets. They have got stuck in the mundane job and have no time or inclination for monitoring’. I told jogi, ‘Jogi please stop these sarcastic taunting and show me some facts and figures to help me understand better’. Today RNP has a total of 42 guard posts in the small 392 sq. km area, which means each post or chowki gets less than 9- 10 sq. km area, hence forest guards have to monitor just 3 km distance. RNP at present has strength of more than 400 guard personnel’s [Forest Guard, Cattle Guard, Home Guard, and Ex- Army personnel] which implies that 10 personnel per chowki in a 3x3 km area. 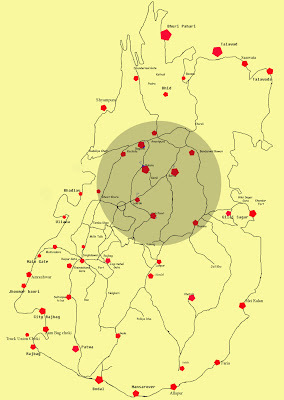 In the highlighted area new chowki’s built recently in the central part of the forest. 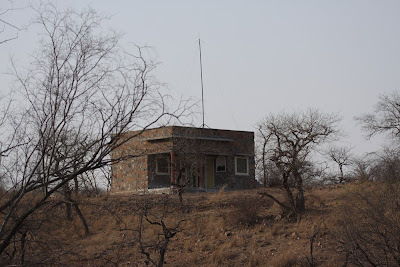 Off late Rajasthan Forest Department (RFD) has constructed 7 forest guard posts (Chowki) in the core areas of the national park. This will put a big anthropogenic pressure in the park. 1. Lakrda Chowki: This is the central point of the park, in earlier times the FD themselves had removed the chowki twice from this area and now once again a new post has been erected in Lakrda region, they cut several trees for construction of this chowki. They could have constructed it on the same place where the earlier chowki was constructed but they chose a new area which is hidden from passing tourist. 2. Bhakola Chowki: This is a perennial water stream; a prime area, the tiger uses as a breeding ground. 3. Bherdha Chowki: Every alternate year a tigress gives birth to cubs at this spot. Bherdha is a relocated village area. 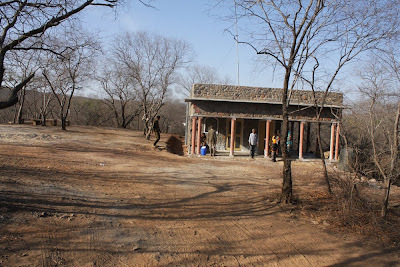 One of the finest habitats of Ranthambhore and now FD has constructed a guard post here too. Distance between bherdha with other chowkis like Bhakola, Anantpura, and Banderwal ki Baowri is just 1-2 km. 4. Chhandawali Chowki: this chowki located in a pristine forest valley. It is very close to Lahpur main guard post. A past interruption was that few years back FD constructed a road here. 5. Takia Kui Chowki: This is very close to Kachida chowki, right over a water hole the FD gives the explanation that this is being created to stop Uliana villagers but if they really want to stop villagers they should construct a chowki on the table top of the hill. 6. High Point Chowki: This is completely undesirable chowki in the central highest point of the park, FD explanation it is to improve their communication network however if it is the reason they can build a communication tower at this junction. 7. Indala Chowki: This is the only chowki which is useful for the protection of the park. Forest guards use the same water holes for bathing & washing their clothes; this not only disturbs the animal but also a risk to their own health. Should i drink this detergent water??? Several new road constructions in the forest they have cut many trees, RNP already has several roads, tourists using some of these roads and disturbing animals. 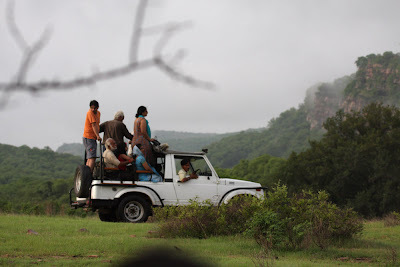 Ranthambhore already has enough road system in the park hence there is no need to construct more roads in the park. In Ranthambhore there is huge exchange of monetary funds on road maintenance and road construction. 1. Adidant to Kachida road: Recently FD opened Lambi ka Nalla spoiling the entire area by making it assessable to tourists and for this they constructed several roads connecting to Lambi ka nalla. Now from Lambi ka nalla’s Adidant area they have constructed a road taking to Kachida. For making this road they used heavy machines like excavator chopped hundreds of trees, the work continued for many months during which many workers were there in the park. This route is not open for tourists but government vehicles use it. There was no need as from Tamakhan Bhoot khurra and Bhakola road could be used to reach this place. 2. Lambi ka nalla road – Lambi is about 5 kilometre long perennial water stream. Recently FD made a road to explore this area and later it was opened for tourists as well. Several tourist vehicles now go there. It was a completely undesirable road as it could have been monitored from the hill top. 3. 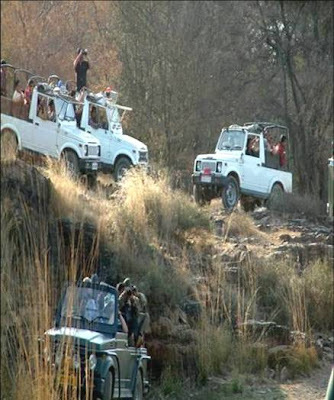 Semli to Lakarda road – FD says that his is a ‘fire-line’ but VIP vehicles, forest vehicles and sometimes even tourist vehicles use this road for sighting purposes. 4. Berda tiraya to thumka road – FD cut hundreds of trees for this road which was again called ‘fire-line’ but again several tree canopies still at close proximity making it equally vulnerable for forest fires. 5. Nalghati to Mandoop Road – there was no reason to make this road, it is at a steep and hence this road will increase forest erosion. The FD constructed six talai’s and 10 anicuts in an area of 3 km. All the talai’s and anicuts are made on porous land, during the monsoon period for 2-3 months definitely it will hold water during which the trees in that area of the talai will be submerged and die; while for the rest part of the year the talai will dry out due to the land porosity. 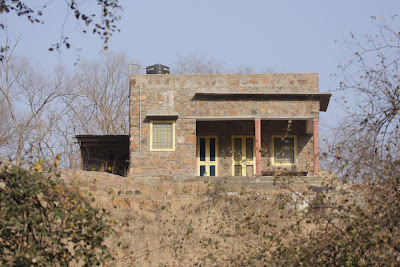 Ranthambhore is a dry deciduous forest, converting habitat of a dry deciduous forest to a wet area, this altering of habitation makes many changes. During monsoons the water gets filled in these artificial Talai’s but these don’t hold water for long. Hence the forest money and resources go in waste for construction of these artificial water bodies. Besides these talai’s but it ends up changing the soil conditions and increasing ground seepage. This is a cause of habitat loss for several animals living in the burrows like field mouse, ground birds like quails, partridges, etc. 1. Water bodies are made very close to each other. 2. In some places without catchments area around there is construction of water harvesting structures done. 3. The area selection was not right in many places, the soil in some places is porous while in others its sandy so the water holding capacity is low. 4. Places where water bodies are constructed are very good Dhonk forest area and these trees are now submerged in water, our estimate is 3000 such trees. 5. The main dam wall is low while the side walls are high. It is against the basic logistics of construction. 7. All this was neither mentioned in the Park Management plan nor was it passed by the Supreme Court constituted Central Empowered committee (CEC) making it unlawful as well. 8. In recent times the FD took donations from various sources and constructed many more talai’s inside the core areas of the forest too... in return they put such foundation stones in many places of the forest! For all the construction done even the rules of tender were not followed. 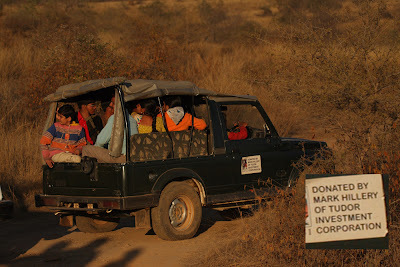 Ranthambhore Tiger reserve is a very fragile park we should treat it with sensibility and seriously. some rangers are posted here since as long as 15 years and their main activity is taking care of all this construction work one can imagine, hence all this money making gimmicks should stop. 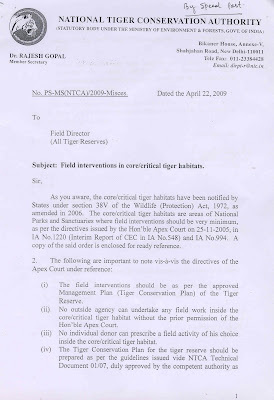 Subject: Field intervention in core/critical tiger habitats. As you aware, the core/critical tiger habitats have been notified by States under section 38V of the Wildlife (Protection) Act, 1972, as amended in 2006. The core/critical habitats are areas of National Parks and Sanctuaries where field interventions should be very minimum, as per the directives issued by the honourable Apex Court on 25-11-2005, in 1A No.1220 (Interim Report of CEC in 1A No.548) and 1A No.994. A copy of the said order is enclosed for further reference. (i) The field interventions should be as per approved Management Plan (Tiger Conservation Plan) of the Tiger Reserve. (ii) No outside agency can undertake inside the core/critical tiger habitat without the prior permission of the Hon’ble Apex Court. (iii) No individual donor can prescribe a field activity of his choice inside the core/critical tiger habitat. (iv) The Tiger Conservation Plan for the tiger reserve should be as per the guidelines issued by vide NTCA Technical document 01/07, duly approved by the competent authority as prescribed in the Wildlife (Protection) Act,1972, as amended in 2006. 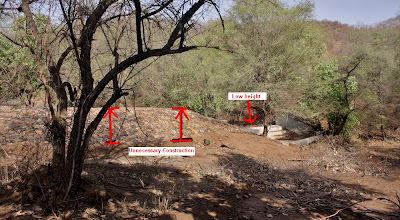 (v) Since the core/critical tiger habitats are meant to be kept inviolate for tigers, artifacts like foundation stone, commemorative exhibits/signage should not be constructed in such areas at any cost. 3. 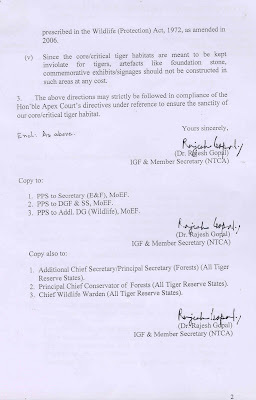 The above directions may strictly be followed in compliance of the Hon’ble Apex Court’s directives under reference to ensure the sanctity of the core/critical tiger habitat. Nature is fragile.. . Too much of intrusion will only cause disturbance which might even be irreversible.. . Also, the use of recourses wisely and efficiently can save and protect the delicate ecosystem. बहुत उम्दा ब्लाग बनाया है आप ने कुछ मशविरा मुझे भी दे भाई! Hello Divya, Great job on this wonderfully well compiled blog entry. What a treat! On the subject of getting the attention of the Environment Minister, it may indeed work better from an action point of view to get him some embarrassment as well, preferably from international press. It is only when Indians are embarrassed that we actually get up to work. Cheers! BSK.